Last French Friday Dadurling asked me what diorama I used for the shots of the 205 GTI, I thought I’d share the answer. A bit. 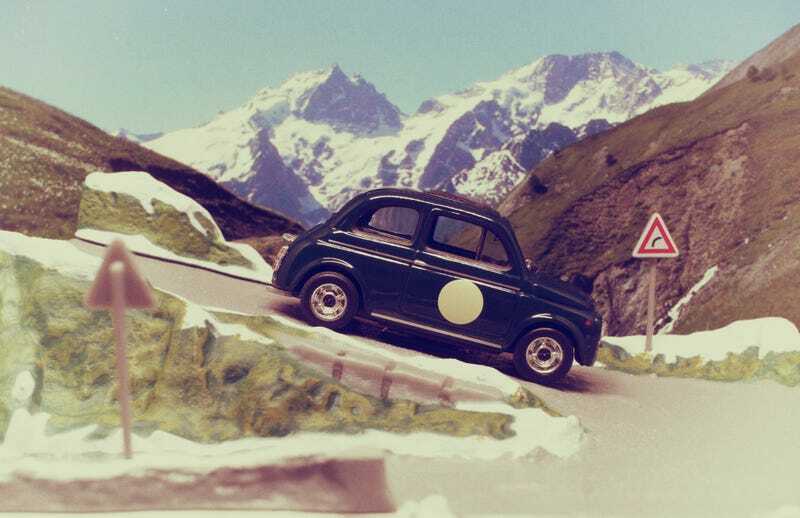 Well, it’s one of Atlas’ sets of 1/43 FIAT 500 derivatives on a small diorama. I’ve shown one before (at least!! ), the Donati Abarth 595. That one was set in a little village, this one on a twisty mountain road. And yes they’re 1/43 but as the FIATs are so small the dioramas fit 1/64s way better! Spaghetti Sunday: Quanti zaini avete bisogno? And on the nameplate the type of car is displayed. But if you ask me, that’s an error. As there was a road legal Giannini 500 TV (Turismo Veloce) for sale but for rallies one could order a Giannini 500 Montecarlo. I’m sure there were parts interchangeable but still. Could be that I’m mistaken though as someone did research all those badges on the back. I suppose. And it’s all there! But who/what was/is Giannini in the first place? Giannini was Carlo Abarth’s nemesis. His biggest competitor when it comes to tuning little FIATs in the ‘60's. Giannini Automobili SpA was founded by Domenico Giannini in 1963 when he split up the long existing company he started years before that with his brother Attilio. Only 4 years after the start though Dominico suffered a heart attack and died, bringing the young company to it’s knees already. The shareholders introduced a lawyer to pick up the pieces, Volfango Polverelli, and started mending the company a bit. Quite successfully as the company, unlike Abarth, still exists. On their own. Without being taken over by FIAT. They do work together intensively though. Nowadays it’s mainly converting interior and exterior instead of taking care of those engines. And one of their biggest customers is the Guarda di Finanza, a military police force responsible for dealing with financial crime and smuggling. And I’m sure I’ll do a more extensive story on Giannini another time. For now it’s the weekend so... Ciao Tutti! Look at that Fumo blu! It’s burning oil!